Shanghai, China– – DyStar® Group will introduce their latest development – Cadira Reactive – at Interdye Shanghai on April 13-15, 2016. Cadira is a new module in DyStar’s Resource Efficiency program. The Cadira concepts considerably reduce water, waste and energy consumption. Cadira will help Brands & Retailers and their production partners to save valuable resources and to reduce the carbon footprint of their textile goods. The first launch under the Cadira program is the Cadira Reactive concept for reactive cellulose dyeing. Another highlight for sustainable exhaust and continuous dyeing of cellulosic is the new Levafix® ECO range, completely free of p-CA and other regularly controlled amines. Very interesting for the manufacturers of Denim and for Brands and Retailers is the denim solution package. The core denim product is their patented DyStar Indigo Vat 40% Solution, the cleanest indigo on the market. In addition DyStar presents coatings for different blues and Lava® chemicals for fashionable wash effects. The digital printing team of DyStar is proud to present their innovative Jettex® intense inks based on novel chemistry, providing particular process advantages especially for fashion printers. As part of the Dystar Textile Services team, Texanlab, a leading testing institute based in South Asia, will showcase their comprehensive range of testing services for textiles, leather, footwear, jewelry, dyes and auxiliaries. In addition there will be interesting solutions for Automotive, Fashion and Active Wear. 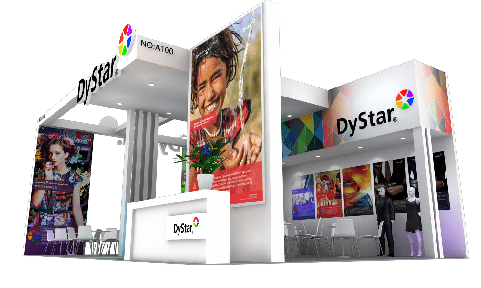 Dystar will welcome their visitors in Stand A100.